In a far away land of intricate patterns, saturated colors and secret gardens, join artists Mati McDonough and Faith Evans-Sills on the exotic journey of a lifetime. This adventure is currently sold out. Get on the waitlist! THIS ADVENTURE IS currently SOLD OUT. get on the waiting list! Enter your name and email address to be put on the waiting list for the Sacred Within Morocco 2018 retreat. $900 NON-REFUNDABLE DEPOSIT REQUIRED TO HOLD YOUR SPOT. TOTAL BALANCE IS DUE JULY 15TH, 2018. PAYMENTS PLANS ARE AVAILABLE, PLEASE SEE FAQ'S BELOW FOR DETAILS. Lunch at Riad Yasmine will be served family style on the Moroccan tiled terrace, where local women will join us to paint our hands with Henna patterns. There will also be free time at Riad Yasmine to enjoy the grounds and pool and an afternoon trip to the Majorelle Gardens, followed by optional Camel Rides in the desert at sunset. Breakfast at Riad Yasmine followed by an optional trip to the spa for a Moroccan Hammam & Massage Treatment. The afternoon will be yours to explore Marrakech as you wish with free time for additional shopping and sightseeing in town. Lunch & dinner will be enjoyed on your own at a fantastic selection of restaurants that we recommend in town. Yes! Upon receipt of your $900 non-refundable deposit you may divide your remaining total into up to 2 separate payments. Total balance is due July 15th, 2018. Your airfare is not included in the cost. Any meals eaten off Riad Yasmine grounds (4 lunches, 2 dinners). Expect to pay $15-$20 for lunches and $30-$60 (depending on the restaurant) for dinner. Anything you buy in the markets or on various trips will not be covered as well as any extra tours or excursions that you choose during your free time if you choose to go. Yes. Riad Yasmine is a luscious and intimate retreat space, we will have the entire property at our disposal. Each of their rooms are uniquely beautiful with en-suite bathrooms. One of their rooms is single occupancy, which will be given on a first come first served basis (this room is sold out). Their other rooms are double occupancy with two beds per room. We will do our best to pair you up with someone we think you'll match well with. On our retreats the sharing of rooms has fostered close bonds of friendship within the group. Riad Yasmine never uses processed foods and all meals are prepared the old fashion way – from scratch. Vegetarian options are available if we inform the hotel before hand, other food sensitivities can not be accommodated. They provide a fixed daily menu that relies on fresh and organic ingredients. How do I get to Riad Yasmine from The airport and back again? We will secure transportation to and from using a transportation service. When booking flights please plan your landing arrival as close to 3pm local time as possible. On our departure day check-out is at noon. If your flight is later in the day, you are most welcome to lounge around Riad Yasmine as long as you need. Weather in October is likely to be in the 80's. It is expected to be a bit cooler in the evenings with highs in the 60's. We will send you a supply list two months before the start of the retreat. 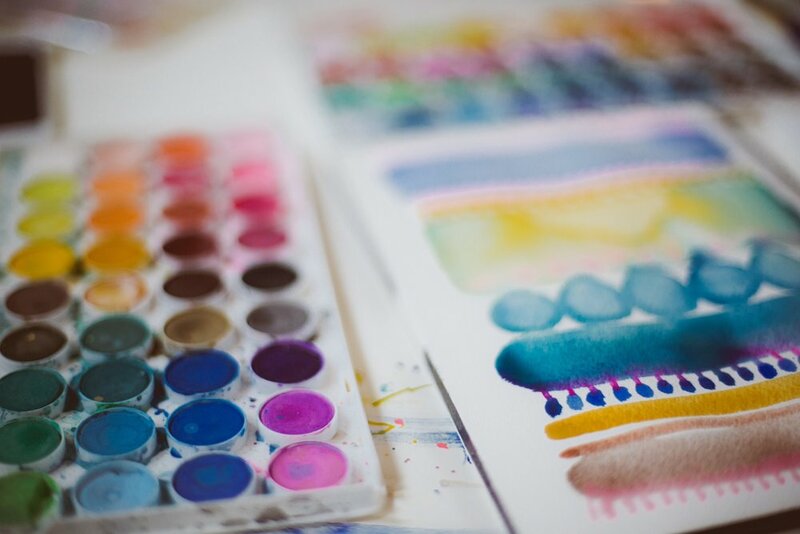 Art supplies will be minimal and will include two 8 x 10 cold-pressed watercolor paper pads, a travel watercolor set full of your favorite colors and a roll of watercolor brushes. We also recommend that you bring an extra bag (a collapsible duffle) to bring home your goodies you have collected on our shopping trips. Morocco truly has some of the best shopping in the world! The temperatures will vary, so don't forget layers, pack a bathing suit, sweater and a light jacket! How should a woman expect to dress in Morocco? We recommend modest clothing for your time in Morocco. During our previous visits, we felt most comfortable in clothing that kept us covered from our knees and elbows up. Long skirts, dresses, pants and layers will work fine! While Morocco is a Muslim country, women are not expected to cover their heads in public. You will see many people of all different styles of dress throughout Morocco. We found this article very helpful on what to pack. Absolutely! This retreat is much more focused on adventure and gathering inspiration, taking notice of your surroundings and approaching your life from a creative and holistic point of view. Painting is just one of the tools we'll encourage you to explore on this retreat. We ask you to approach this trip with a sense of adventure in your heart. We think you are going to love this retreat! We encourage you to do a little research on the area and how to shop before you come. There are many articles available online to help with this. Here is a great one written by Maryam; an American who lives in Marrakech, Travel + Leisure. It will be a mix of laid back down time, exploration, pampering and immersion into a vibrant, lively culture. There will be no refunds for this Retreat due to the planning and logistics involved. When you register be sure to know all you can about traveling to Morocco. The Retreat is sold out, how do I get on the waiting list? Send an email to faithevanssillsstudio@gmail.com to put your self on our waiting list. If a spot does open up on this retreat, we will offer it to our waiting list on a first come first served basis, going down that list until the spot is filled. What are former retreat participants saying? "My recent trip to Morocco with Faith and Mati was the soulful healing I needed. I have been painting for years, and was in a bit of a creative lull. I was looking forward to spending time with like-minded women and seeing a new area of the world...and hopefully leaving with some inspiration. By painting with other women and delving into the creative process in such a spiritual place, I ended up uncovering some deeper truths and returning home with a sense of creative wholeness. My trip to Marrakesh was a gift in so many ways..... and Mati and Faith's guidance made it possible. Not only did I have a wonderful experience, but I left having made some lifelong friendships." ~Daniela B. "When people ask what my favorite memories are I can say it’s been traveling to beautiful destinations with Mati and Faith! I’ve gone to Costa Rica and Morocco with them and both trips have changed my life for the better! Not only are you discovering new places, but also exploring parts of yourself through art making. Being able to travel and create colorful artwork while making new friendships have been the most transformative and joyful moments in my life. If you want to be nurtured and truly feel awakened, I suggest art retreats because it’s 100% happiness! "~Lily U. Submit your name and email address to get on the waiting list for the Sacred Within Morocco 2018 retreat.